The Iridium GO! 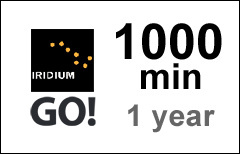 1000-min airtime voucher refills your existing Iridium GO! prepaid account. Returns and Cancellations. You can request a cancellation only if the voucher has not yet been loaded to your Iridium account. Prepaid vouchers that have been loaded to a prepaid account are NOT returnable or refundable, no exceptions! Maximum Account Validity. The maximum validity of Iridium GO! accounts cannot exceed 2 years from the date of the most recent voucher reload. Maximum Age Limit. The Maximum Age Limit of the minutes in this GO! voucher is 3 years. Any unused minutes on your existing Iridium prepaid account will be rolled over ONLY if a new voucher is purchased AND deposited BEFORE the expiration date of the current voucher. Make sure that you order a new voucher at least three (3) business days before the expiration date. We do not guarantee timely reload for vouchers ordered at a later time. You can use this prepaid voucher only if you have an Iridium prepaid account (SIM) supplied and activated by SATTRANS. We cannot reload minutes on other providers' SIM-cards. If you don't have an account with Sattrans, you can always purchase and activate a new Iridium Prepaid Plan. By purchasing and using Iridium prepaid SIM-cards, airtime vouchers and services, you agree to SATTRANS Iridium Prepaid Account Rules.